aFrom the Department of Radiology, University of Minnesota, Minneapolis, Minnesota. BACKGROUND AND PURPOSE: Acute stroke presentation and outcome depend on both ischemic infarct volume and location. We aimed to determine the association between acute ischemic infarct topology and lesion volume and stroke severity at presentation and discharge. MATERIALS AND METHODS: Patients with acute ischemic stroke who underwent MR imaging within 24 hours of symptom onset or last seen well were included. Infarcts were segmented and coregistered on the Montreal Neurological Institute-152 brain map. Voxel-based analyses were performed to determine the distribution of infarct lesions associated with larger volumes, higher NIHSS scores at admission and discharge, and greater NIHSS/volume ratios. RESULTS: A total of 238 patients were included. Ischemic infarcts involving the bilateral lentiform nuclei, insular ribbons, middle corona radiata, and right precentral gyrus were associated with larger infarct volumes (average, 76.7 ± 125.6 mL versus 16.4 ± 24.0 mL, P < .001) and higher admission NIHSS scores. Meanwhile, brain stem and thalami infarctions were associated with higher admission NIHSS/volume ratios. 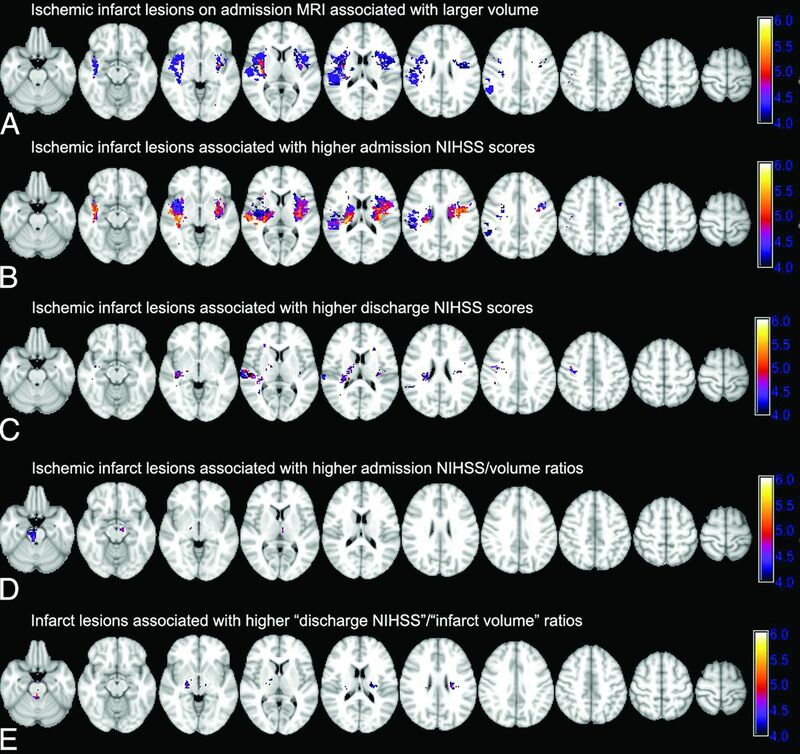 The discharge NIHSS scores were available in 218 patients, in whom voxel-based analysis demonstrated that ischemic infarcts of the bilateral posterior insular ribbons, middle corona radiata, and right precentral gyrus were associated with more severe symptoms at discharge, whereas ischemic lesions of the brain stem, bilateral thalami, and, to a lesser extent, the middle corona radiata were associated with higher ratios of discharge NIHSS score/infarct volume. CONCLUSIONS: Acute ischemic infarcts of the insulae, lentiform nuclei, and middle corona radiata tend to have larger volumes, more severe presentations, and worse outcomes, whereas brain stem and thalamic infarcts have greater symptom severity relative to smaller lesion volumes. In addition to volume, the location of an infarct is fundamentally linked to neurologic deficits. There is a limited correlation between the infarct volume and the severity of stroke symptoms; while the infarct volume accounts for 38% of the variation in stroke severity, the combination of both infarct volume and location can account for 62% of the variation in NIHSS scores.8 Thus, there has been recent effort to assess the relationship between the infarct topology and outcome in patients with stroke.9⇓⇓–12 Specifically, some studies reported that ischemic infarcts in the insular ribbon, lentiform nucleus, and corona radiata are associated with poor prognosis in patients with stroke.10,13,14 However, there are limited prior studies on voxel-based evaluation of the relationship between acute infarct location and volume in these patients. The primary goal of our study was to determine the location of acute ischemic infarcts with larger volumes on admission MR imaging by using a voxel-based analysis. It is likely that the distribution of infarct lesions with larger volumes could, at least in part, explain some of the recent findings on the topographic correlation of admission infarct distribution and clinical presentation, as well as outcome. Also, the present study investigated the interconnection of infarct topology, lesion volume, and severity of symptoms at admission and discharge. Additionally, we evaluated the distribution of infarct lesions with higher ratios of NIHSS-to-infarct volume, which represent worse clinical deficits relative to smaller lesion size. The voxel-based analysis of lesion-location volume or location-symptom relation can search for significant associations between infarct topology and outcome variables without a priori cerebral parcellation, compared with an atlas-based image analysis methodology.11,12 Such findings can potentially be the basis for development of a “hazard atlas” of the brain to predict clinical outcome and, perhaps, response to treatment on the basis of infarct distribution and size at the time of admission. This study was approved by the institutional review boards at the University of Minnesota Medical Center, Hennepin County Medical Center. The medical and imaging records of all patients who were admitted with a diagnosis of stroke to those 2 hospitals were reviewed between January 2011 and December 2014. Patients were included in this study if all of the following criteria were present: 1) They underwent MR imaging within 24 hours of symptom onset or, alternatively, at the time last seen well; 2) the patient had a “unilateral” acute ischemic infarct based on DWI; and 3) the patient had no evidence of intracranial hemorrhage on the admission CT or MR imaging examinations. As per the stroke registry protocol of the 2 institutions, the NIHSS score is recorded for all patients presenting with stroke symptoms, as a measure of symptom severity.11,12 The demographic data, time to scan, stroke risk factors, and reperfusion therapy data were all extracted from the electronic medical record. Infarct lesions were manually segmented on the admission DWI via the MRIcron software (http://www.mccauslandcenter.sc.edu/crnl/).15 An intensity filter was used to augment selection and segmentation of the DWI-hyperintense lesions. The lesion volumes were also calculated by using the above-mentioned software. Thereafter, the infarct lesion volumes, along with the corresponding DWI scan, were coregistered to the Montreal Neurological Institute-152 brain space by using the FMRIB Linear Image Registration Tool (FLIRT; http://www.fmrib.ox.ac.uk/).16 To illustrate the distribution of infarct lesions across this cohort of patients, we created a summation color-coded overlay map with each voxel showing the number of patients with an infarct at that voxel coordinate (On-line Fig 1A). For voxel-based analysis, the nonparametric mapping toolbox included in the MRIcron software package was used.10,15 Five series of group comparisons were performed for each voxel (infarcted versus noninfarcted) with the following: 1) the admission infarct volume, 2–3) the NIHSS scores at the admission and discharge (if available), and 4–5) the ratio of NIHSS/volume at the admission and discharge. Separate Voxel-Based Lesion Symptom Mapping (VLSM) analyses were also performed for voxel-based topographic association of admission infarct location with component scores of upper extremity motor (question 5), lower extremity motor (question 6), and language functions (sum scores of questions 9 and 10) on the admission NIHSS test. The software uses the Brunner-Munzel rank order test, and the results provide a corresponding z score map, in which higher values indicate the association of an infarct at that specific voxel with either larger lesion volume, more severe symptoms, or a higher NIHSS/volume ratio, respectively (Fig 1). To correct for multiple comparisons, we performed a family-wise error Bonferroni correction with 2000 permutations to compensate for the small sample size. To achieve optimal statistical power, we included only voxels affected in at least 10 patients in the voxel-based analysis (On-line Fig 1B), as suggested by prior studies.17 For each series of analyses, the family-wise error Bonferroni-corrected z scores corresponding to .05 and .01 P value thresholds are listed with the depiction window narrowed to approximate corresponding levels (Fig 1 and On-line Fig 2). Voxel-based analysis of the association of admission infarct location with infarct volume, admission and discharge NIHSS scores, and NIHSS/volume ratios. The color range shows z scores, and corresponding P value thresholds are calculated after family-wise error Bonferroni correction for multiple comparisons and applying 2000 permutations. A, Ischemic infarcts are associated with larger admission DWI-lesion volumes. Higher family-wise error scores are associated with larger lesion volumes: z score = 4.27 → P value = .05; z score = 4.96 → P value = .01. B and C, Infarct lesions in voxels with higher z scores are associated with higher admission NIHSS scores (z score = 4.35 → P value = .05; z score = 4.93 → P value = .01) and discharge NIHSS scores (z score = 4.23 → P value = .05; z score = 5.01 → P value = .01). D and E, Voxel-based analysis of NIHSS/volume ratio highlights those regions where infarction is associated with a higher ratio of admission (D) and discharge (E) NIHSS scores per infarct volume, so infarction is associated with worse clinical symptoms despite a smaller volume (for admission ratios: z score = 4.30 → P value = .05; z score = 4.98 → P value = .01; for discharge ratios: z score = 4.30 → P value = .05; z score = 5.15 → P value = .01). The data are expressed as mean ± SD, frequency (percentage) or median (interquartile range) when appropriate. The z score maps from the VLSM analysis were used to develop brain masks and dichotomize patients into 2 groups on the basis of whether their infarct lesions overlapped with the brain mask. An independent samples Student t test was performed to compare the average lesion volumes between the dichotomized groups; and a Mann-Whitney U test was used for comparison of the NIHSS scores. All statistical analyses were performed by using the SPSS for Mac, Version 21.0 (IBM, Armonk, New York). A P value < .05 was considered statistically significant. A total of 238 patients were included in this series. The patient characteristics are summarized in the Table. MR imaging was performed at a mean of 13.6 ± 7.1 hours after symptom onset or time last seen well. On-line Fig 1 illustrates the distribution of infarcts among patients. Most infarcts were centered at the insular ribbon and lentiform nuclei, with less frequency at the periphery of the MCA territory and posterior circulation. Overall, 70 (29.4%) patients had ischemic infarct lesions within the posterior circulation territory; and 120 (50.4%) had a right-sided stroke. The average infarct volume on admission DWI was 39.5 ± 84.9 mL. Fig 1A depicts the VLSM analysis results of lesion volume-location correlation. Infarctions of the bilateral lentiform nuclei, insular ribbons, central corona radiata, and the right precentral gyrus were associated with larger infarct volumes. A brain mask was developed by using the z score map corresponding to a family-wise error–corrected P value of .05, to dichotomize infarcts into high-versus-low volume (Fig 1A). On average, the volume of ischemic infarcts that involved the highlighted regions in Fig 1A (76.7 ± 125.6 mL) was higher than those that spared these regions (16.4 ± 24.0 mL, P < .001). Fig 1B highlights the cerebral regions where infarction is associated with higher admission NIHSS scores based on the VLSM analysis. Infarct lesions localized to the insula bilaterally and corona radiata and, to a lesser extent, the right precentral gyrus were associated with higher NIHSS scores at admission. On-line Fig 2 shows the distribution of infarct lesions associated with higher component NIHSS scores for the upper and lower extremity motor deficit and aphasia/dysarthria at the time of admission. Overall, ischemic infarct lesions of the bilateral periventricular white matter and middle corona radiata and the bilateral precentral gyri were associated with higher scores of upper and lower extremity motor deficits—questions 5 and 6, respectively—on the admission NIHSS test (On-line Fig 2A, -B). Higher sum scores on questions 9 (best language) and 10 (dysarthria) were associated with infarct lesions in the left inferior frontal lobe, insular ribbon, and high left precentral gyrus (On-line Fig 2C). Patients were discharged between 1 and 33 days after stroke onset with 215 (90.3%) discharged within 10 days of admission (Table). The discharge NIHSS scores were available in 218 (91.6%) patients. Ischemic infarct lesions in the bilateral middle corona radiata, posterior insular ribbons, and right precentral gyrus were associated with more severe symptoms at discharge (Fig 1C). Notably, there was no significant difference in admission or discharge NIHSS scores between patients with right-versus-left hemisphere ischemic stroke in univariate analysis (P values = 0.569 and 1.000, respectively). The infarct lesions in the brain stem and, to a lesser extent, the bilateral thalami were associated with higher admission NIHSS/volume ratios (Fig 1D). The patients were then dichotomized into 2 groups: those with infarction within the brain stem (ie, midbrain, pons, or medulla) and/or thalami versus those with an infarct that spared these regions. The average volume of ischemic infarcts involving the brain stem and/or thalami (21.5 ± 35.1 mL) was less than that of infarcts sparing these regions (43.6 ± 92.1 mL, P = .010), whereas, patients with brain stem/thalami infarcts had higher admission NIHSS scores (median, 6; interquartile range, 3–11) compared with the remainder of patients (median, 4; interquartile range, 2–7, P = .006). Similar results were found for the topographic distribution of discharge NIHSS score/admission infarct volume ratio (Fig 1E); higher ratios were found in the brain stem, bilateral thalami, and, to an extent, the bilateral middle corona radiata. Among 218 patients with available discharge NIHSS scores, the average volume of ischemic infarcts involving the brain stem and/or thalami (22.6 ± 33.1 mL) was smaller compared with infarcts sparing these regions (39.3 ± 72.6 mL, P = .048), with no significant difference in discharge NIHSS scores between these 2 subgroups (P = .336). The present study found a topographic overlap in the distribution of acute ischemic infarcts associated with larger lesion volumes, more severe admission symptoms, and worse clinical deficits at discharge. It seems that infarct lesions affecting the insular ribbon, lentiform nuclei, and middle corona radiata in the acute phase represent an ominous sign in terms of clinical presentation and outcome, which could be, at least in part, due to their larger size. On the other hand, those patients with acute ischemic infarcts in the brain stem and thalami had more severe neurologic deficits relative to smaller infarct volumes at presentation and discharge. These findings are in accordance with and can partially explain the mechanism of the recent reports linking acute infarcts of the insula, lentiform nuclei, and periventricular white matter with poor prognosis in anterior circulation stroke.9,10,13,14,18 The results suggest that admission infarct topology, possibly along with the integration of clinical findings and lesion volume, can be applied to develop a quantitative population-based probability map for prediction of long-term outcome or assessment of treatment risk versus benefit. Regarding outcome prediction, various imaging and clinical variables at stroke presentation have been shown to help predict the clinical outcome. Such predictors described within the literature include the severity of symptoms at presentation (ie, NIHSS score), prestroke mRS score, patient age, and blood glucose level at baseline.4,5 As for imaging-based scoring systems proposed for prediction of stroke outcome, ASPECTS is the most widely used tool.1 However, each DWI-ASPECTS score may represent a wide range of infarct volumes,21 which could be, in part, due to unequal weighing of different MCA regions in ASPECTS, favoring the basal ganglia.22 The results of this study demonstrate that larger infarcts and those associated with more severe symptoms at admission and discharge tend to involve the lentiform nuclei and adjacent insular ribbon, which may explain the prognostic power of the ASPECTS scoring tool despite volumetrically unequal region components. Recently, there have been growing attempts at prediction of stroke outcome based on the infarct topology.9⇓⇓⇓⇓–14 A penalized logistic analysis of ASPECTS component scores on pretreatment CT in the National Institute for Neurological Disorders Tissue Plasminogen Activator trial found that infarction of the lentiform nucleus and parieto-occipital junction (M6 region) predicts poor outcome in older patients.13 A voxel-based analysis reported an association between infarction of the central corona radiata, internal capsule, and insular ribbon with higher mRS scores on 1-month follow-up.10 The current study suggests that admission ischemic infarcts within the insular ribbon, lentiform nuclei, and middle corona radiata are predictors of poor neurologic function at discharge, in part, due to larger lesion volume of infarcts involving these areas and their association with more severe symptoms at presentation. On the other hand, special attention should be paid to the less frequent posterior circulation ischemic infarcts involving the brain stem and thalami, given that such lesions tend to have relatively prominent neurologic deficits at admission and discharge despite their smaller volume. Posterior circulation infarcts compose 20%–25% of ischemic strokes.23 Many prior studies on lesion-function correlation have focused on patients with anterior circulation stroke,9,10,18 presumably due to the lower rate of posterior circulation stroke. In the current study, posterior circulation infarcts were not associated with higher NIHSS values on overall VLSM analysis; however, infarctions of the brain stem and thalami were associated with higher ratios of admission and discharge NIHSS scores relative to acute infarct volume. In addition, those patients with ischemic lesions of the brain stem or thalami had higher admission NIHSS scores compared with the remainder of patients. Given the lower rate of posterior circulation infarcts and their smaller volume, it seems pertinent to run a separate analysis for patients with anterior-versus-posterior circulation territory stroke for the development of an inclusive imaging-based prognostic model. Another consideration would be to investigate the relationship of infarct volume in each vascular territory to the territory volume to demonstrate the relative impact of different infarct lesion volumes in a given arterial territory. However, there is no consensus regarding the precise boundaries of different vascular territories, given the great interpatient variability, which can introduce limitations and bias in calculations. One of the limitations of our study is the variability of the onset-to-MR imaging interval gap duration. We tried to minimize such an effect by restricting our inclusion criteria to those patients who underwent MR imaging within 24 hours of stroke. However, the inclusion of patients who had MR imaging within the first 24 hours of stroke might introduce a selection bias because some of the sickest patients with large infarct volumes have only undergone CT. The relatively mild stroke symptoms in our patient cohort were reflected in the median NIHSS scores of 4 at presentation and 2 at 24 hours and discharge, which may limit the extrapolation of these findings to other cohorts. Moreover, some of the vertebrobasilar distribution infarct lesions might be false-negative on early DWI within the first 24 hours of stroke, which might introduce some limitations in our study.25 Also, as an inherent limitation of the current study, the VLSM is affected by the variability in the regional frequency of infarct lesions throughout the brain, so those regions that are scarcely infarcted may not be well-evaluated (eg, anterior cerebral artery, and posterior circulation territory). In addition, limiting the inclusion criteria to those patients with unilateral infarct lesions might introduce a selection bias by excluding patients with brain stem infarcts that crossed the midline. Thus, the slight asymmetry in lateralization of a higher NIHSS/volume ratio in the right brain stem is most likely secondary to the limited number of patients rather than a true physiologic right-versus-left difference. Additionally, a multivariate voxel-based analysis for correction of findings based on different risk factors or stroke subtypes can further promote our knowledge of the correlation between infarct location and lesion volume and stroke severity. Finally, the follow-up evaluations (namely, the 3-month mRS score) were not available in all patients, and discharge NIHSS scores obtained at variable time points after stroke onset may not provide an accurate and homogeneous measure for early outcome. Nonetheless, the purpose of the current study was not to derive a predictive model for outcome but rather to explore the association between lesion volume and anatomic distribution of infarcts with attention to the severity of symptoms at presentation. There has been growing interest in the assessment of infarct location for the prediction of clinical outcome, and some have suggested that the location of cerebral ischemia rather than volume can predict clinical outcome. This study found a topographic overlap between the distribution of infarct lesions with larger volumes and more severe neurologic deficits at admission and discharge. These findings may, in part, explain the underlying mechanism of recent imaging-based predictive models that have noted a poor prognosis of ischemic infarcts involving the insular ribbon, lentiform nuclei, and middle corona radiata, suggesting that such lesions not only affect the eloquent cerebral regions and major white matter neural pathways but also reflect larger infarct sizes. On the other hand, among the less frequent posterior circulation strokes, brain stem and thalamic infarcts were associated with worse symptoms relative to their smaller lesion volumes. Such findings may potentially be the basis of designing a hazard atlas of the brain for prognostication and treatment triage of acute ischemic stroke. Disclosures: Alexander M. McKinney—UNRELATED: Other Relationships: medicolegal consultation <$5000 per annum. The data were partially presented at: Annual Meeting of the American Society of Neuroradiology, May 21–26, 2016; Washington, DC. Accepted after revision August 22, 2016.